A printer inspecting a large forme of type on a cylinder press. Each of the islands of text represents a single page, the darker blocks are images. The whole bed of type is printed on a single sheet of paper, which is then folded and cut to form many individual pages of a book. Letterpress printing was the normal form of printing text from its invention by Johannes Gutenberg in the mid-15th century until the 19th century and remained in wide use for books and other uses until the second half of the 20th century. Letterpress printing remained the primary means of printing and distributing information until the 20th century, when offset printing was developed, which largely supplanted its role in printing books and newspapers. All forms of data collection were affected by the invention of letterpress printing, as were many careers such as teachers, preachers, physicians and surgeons and artist-engineers. More recently, letterpress printing has seen a revival in an artisanal form. Johannes Gutenberg is credited with the development in the western hemisphere, in about 1440, of modern movable type printing from individually cast, reusable letters set together in a form (frame or chase). Movable type was first invented in China using ceramic type in 1040 AD. Gutenberg also invented a wooden printing press, based on the extant wine press, where the type surface was inked with leather-covered ink balls and paper laid carefully on top by hand, then slid under a padded surface and pressure applied from above by a large threaded screw. It was Gutenberg's "screw press" or hand press that was used to print 180 copies of the Bible. At 1,282 pages, it took him and his staff of 20 almost 3 years to complete. 48 copies remain intact today. This form of presswork gradually replaced the hand-copied manuscripts of scribes and illuminators as the most prevalent form of printing. Printers' workshops, previously unknown in Europe before the mid-15th century, were found in every important metropolis by 1500. Later metal presses used a knuckle and lever arrangement instead of the screw, but the principle was the same. Ink rollers made of composition made inking faster and paved the way for further automation. With the advent of industrial mechanisation, inking was carried out by rollers that passed over the face of the type, then moved out of the way onto an ink plate to pick up a fresh film of ink for the next sheet. Meanwhile, a sheet of paper slid against a hinged platen (see image), which then rapidly pressed onto the type and swung back again as the sheet was removed and the next sheet inserted. As the fresh sheet of paper replaced the printed paper, the now freshly inked rollers ran over the type again. Fully automated 20th-century presses, such as the Kluge and "Original" Heidelberg Platen (the "Windmill"), incorporated pneumatic sheet feed and delivery. Rotary presses were used for high-speed work. In the oscillating press, the form slid under a drum around which each sheet of paper got wrapped for the impression, sliding back under the inking rollers while the paper was removed and a new sheet inserted. 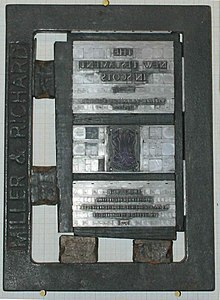 In a newspaper press, a papier-mâché mixture called a flong used to make a mould of the entire form of type, then dried and bent, and a curved metal stereotype plate cast against it. The plates were clipped to a rotating drum and could print against a continuous reel of paper at the enormously high speeds required for overnight newspaper production. This invention helped aid the high demand for knowledge during this time period. 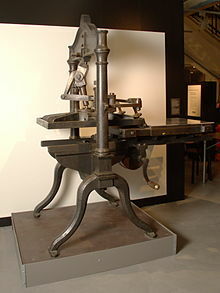 Letterpress printing was introduced in Canada in 1752 in Halifax, Nova Scotia by John Bushell in the newspaper format. This paper was named the Halifax Gazette and became Canada's first newspaper. Bushell apprenticed under Bartholomew Green in Boston. Green moved to Halifax in 1751 in hopes of starting a newspaper, as it did not exist in the area. Two weeks and a day after the press he was going to use for this new project arrived in Halifax, Green died. Upon receiving word about what happened, Bushell moved to Halifax and continued what Green had started. The Halifax Gazette was first published on March 23, 1752, making Bushell the first letterpress printer in Halifax, and eventually Canada. There is only one known surviving copy which was found in the Massachusetts Historical Society. Letterpress started to become largely out-of-date in the 1970s because of the rise of computers and new self-publishing print and publish methods. Many printing establishments went out of business from the 1980s to 1990s and sold their equipment after computers replaced letterpress's abilities more efficiently. These commercial print shops discarded presses, making them affordable and available to artisans throughout the country. Popular presses are, in particular, Vandercook cylinder proof presses and Chandler & Price platen presses. In the UK there is particular affection for the Arab press, built by Josiah Wade in Halifax. Letterpress recently has had a rebirth in popularity because of the "allure of hand-set type" and the differences today between traditional letterpress and computerized printed text. Letterpress is unique and different from standard printing formats that we are currently used to. Letterpress commonly features a relief impression of the type, although this was considered bad printing in traditional letterpress. Letterpress's goal before the recent revival of letterpress was to not show any impression. The type touched the paper slightly to leave a transfer of ink, but did not leave an impression. This is often referred to as "the kiss" An example of this former technique would be newspapers. Some letterpress practitioners today have the distinct goal of showing the impression of type, to distinctly note that it is letterpress but many printers choose to maintain the integrity of the traditional methods. Printing with too much impression is destructive to both the machines and to the type. Since its revival letterpress has largely been used for fine art and stationery as its traditional use for newspaper printing is no longer relevant for use. Letterpress is considered a craft as it involves using a skill and is done by hand. Fine letterpress work is crisper than offset litho because of its impression into the paper, giving greater visual definition to the type and artwork, although it is not what letterpress traditionally was meant for. Today, many of these small letterpress shops survive by printing fine editions of books or by printing upscale invitations, stationery, and greeting cards. These methods often use presses that require the press operator to feed paper one sheet at a time by hand. Today, the juxtaposition of this technique and offbeat humor for greeting cards has been proven by letterpress shops to be marketable to independent boutiques and gift shops. Some of these printmakers are just as likely to use new printing methods as old, for instance by printing using photopolymer plates on restored vintage presses. Letterpress publishing has recently undergone a revival in the USA, Canada, and the UK, under the general banner of the "Small Press Movement". Renewed interest in letterpress was fueled by Martha Stewart Weddings magazine, which began using pictures of letterpress invitations in the 1990s. In 2004 they state "Great care is taken in choosing the perfect wedding stationery – couples ponder details from the level of formality to the flourishes of the typeface. The method of printing should be no less important, as it can enliven the design exquisitely. That is certainly the case with letterpress." In regards to having printed letterpress invitations, the beauty and texture became appealing to couples who began wanting letterpress invitations instead of engraved, thermographed, or offset-printed invitations. Composition, or typesetting, is the stage where pieces of movable type are assembled to form the desired text. The person charged with composition is called a "compositor" or "typesetter", setting letter by letter and line by line. Traditionally, as in manual composition, it involves selecting the individual type letters from a type case, placing them in a composing stick, which holds several lines, then transferring those to a larger type galley. By this method the compositor gradually builds out the text of an individual page letter by letter. In mechanical typesetting, it may involve using a keyboard to select the type, or even cast the desired type on the spot, as in hot metal typesetting, which are then added to a galley designed for the product of that process. The first keyboard-actuated typesetting machines to be widely accepted, the Linotype and the Monotype, were introduced in the 1890s. The Ludlow Typograph Machine, for casting of type-high slugs from hand-gathered brass matrices, was first manufactured in Chicago in 1912 and was widely used until the 1980s. Many are still in use and although no longer manufactured, service and parts are still available for them. A single-page forme for printing the front page of the New Testament. The black frame surrounding it is the "chase", and the two objects each on the bottom and left side are the "quoins"
Broadly, imposition or imposing is the process by which the tied assemblages of type are converted into a form (or forme) ready to use on the press. A person charged with imposition is a stoneman or stonehand, doing their work on a large, flat imposition stone (though some later ones were instead made of iron). Low-height pieces of wood or metal furniture are added to make up the blank areas of a page. The printer uses a mallet to strike a wooden block, which ensures tops (and only the tops) of the raised type blocks are all aligned so they will contact a flat sheet of paper simultaneously. Lock-up is the final step before printing. The printer removes the cords that hold the type together, and turns the quoins with a key or lever to lock the entire complex of type, blocks, furniture, and chase (frame) into place. This creates the final forme, which the printer takes to the printing press. In a newspaper setting, each page needs a truck to be transported – 2 pages need 2 trucks hence the term double truck. The first copy is proofed again for errors before starting the printing run. You can distinguish a traditional letterpress printer from a digital printer by its debossed lettering. A traditional letterpress printer made a heavy impression into the stock and producing any indentation at all into the paper would have resulted in the print run being rejected. Part of the skill of operating a traditional letterpress printer was to adjust the machine pressures just right so that the type just kissed the paper, transferring the minimum amount of ink to create the crispest print with no indentation. This was very important as when the print exited the machine and was stacked having too much wet ink and an indentation would have increased the risk of set-off (ink passing from the front of one sheet onto the back of the next sheet on the stack). The letterpress printing process remained virtually unchanged until the 1950s when it was replaced with the more efficient and commercially viable offset printing process. The labor-intensive nature of the typesetting and need to store vast amounts of lead or wooden type resulted in the letterpress printing process falling out of favour. In the 1980s dedicated letterpress practitioners revived the old craft by embracing a new manufacturing method which allowed them to create raised surface printing plates from a negative and a photopolymer plate. Photopolymer plates are light sensitive. On one side the surface is cured when it is exposed to ultraviolet light and other side is a metal or plastic backing that can be mounted on a base. The relief printing surface is created by placing a negative of the piece to be printed on the photosensitive side of the plate; the light passing through the clear regions of the negative causes the photopolymer to harden. The unexposed areas remain soft and can be washed away with water. With these new printing plates, designers were no longer inhibited by the limitations of handset wooden or lead type. New design possibilities emerged and the letterpress printing process experienced a revival. Today it is in high demand for wedding stationery however there are limitations to what can be printed and designers must adhere to some design for letterpress principles. Rotary letterpress machines are still used on a wide scale for printing self-adhesive and non-self-adhesive labels, tube laminate, cup stock, etc. The printing quality achieved by a modern letterpress machine with UV curing is on par with flexo presses. It is more convenient and user friendly than a flexo press. It uses water-wash photopolymer plates, which are as good as any solvent-washed flexo plate. Today even CtP (computer-to-plate) plates are available making it a full-fledged, modern printing process. Because there is no anilox roller in the process, the make-ready time also goes down when compared to a flexo press. Inking is controlled by keys very much similar to an offset press. UV inks for letterpress are in paste form, unlike flexo. Various manufacturers produce UV rotary letterpress machines, viz. Dashen, Nickel, Taiyo Kikai, KoPack, Gallus, etc. – and offer hot/cold foil stamping, rotary die cutting, flatbed die cutting, sheeting, rotary screen printing, adhesive side printing, and inkjet numbering. Central impression presses are more popular than inline presses due to their ease of registration and simple design. Printing of up to nine colours plus varnish is possible with various online converting processes. But as the letterpress machines are the same like a decade before, they can furthermore only be used with one colour of choice simultaneously. If there are more colours needed, they have to be exchanged one after the other. Letterpress can produce work of high quality at high speed, but it requires much time to adjust the press for varying thicknesses of type, engravings, and plates called makeready. The process requires a high degree of craftsmanship, but in the right hands, letterpress excels at fine typography. It is used by many small presses that produce fine, handmade, limited-edition books, artists' books, and high-end ephemera such as greeting cards and broadsides. 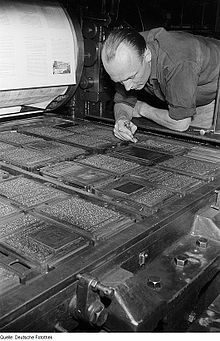 Because of the time needed to make letterpress plates and to prepare the press, setting type by hand has become less common with the invention of the photopolymer plate, a photosensitive plastic sheet that can be mounted on metal to bring it up to type high. Creating files for letterpress is similar to conventional printing. Ink Color: Files are created using spot colors, or CMYK not RGB. A spot color is specified for each color used. Fonts: Type must be five points or larger for best results. For reversed type the point size should be 12-point or larger, as smaller type with its thin stroke can fill in, or plug. An outline stroke is often applied to allow for ink gain. The St Bride Institute, Edinburgh College of Art, Central Saint Martins College of Art and Design, The Arts University Bournemouth, Plymouth University, University for the Creative Arts Farnham, London College of Communication and Camberwell College of the Arts London run short courses in letterpress as well as offering these facilities as part of their Graphic Design Degree Courses. ^ a b c d Letterpress Printing. Encyclopædia Britannica. 2014. ^ Stewart, Alexander A. (1912). The Printer's Dictionary of Technical Terms. Boston, Mass. : North End Union School of Printing. pp. vi–ix. ^ Kafka, Francis (1972). Linoleum Block Printing. Courier Corporation. p. 71. ^ a b c Eisenstein, Elizabeth (2012). The Printing Revolution in Early Modern Europe (2nd ed.). Cambridge University Press. ISBN 978-1107632752. ^ "Over 600 Years of Printing History". beautyofletterpress.com. Retrieved 17 April 2015. ^ "Printing and typesetting". Canadian Science and Technology Museum. 2014. ^ "Nova Scotia Archives". Halifax Gazette. 2014. ^ Breig, James (2014). "Early American newspapering". Colonial Williamsburg. ^ Holson, Laura (2006). "Retro printers, grounding the laser jet". The New York Times. ^ "Letterpress printing". Graphic Design. 2014. ^ Franklin, Allison (2016). "Resurgence of the Letterpress, Actually Thanks to the Internet". INK SOLV 30 blog. ^ "Letterpress". Martha Stewart Weddings. 2004. ^ "Thoughts on traditional letterpress printing". Meridian Press. Archived from the original on November 29, 2014. ^ "Designing for Letterpress". MAGVA Design + Letterpress. Retrieved 16 April 2017. ^ "characteristics of letterpress". Retrieved 2018-08-29. ^ Bednar, Joseph (November 23, 2010). "Making an Impression". BusinessWest. ^ Neugebauer, Hans E. J. (2005). Translated by Wyble, D.; Kraushaar, A. "The Theoretical Basis of Multi color Letterpress Printing". Color Research & Application. 30 (5): 322–331. doi:10.1002/col.20135. ^ "Boxcar Press File Preparation". Boxcar Press. Retrieved 17 April 2015. ^ "Matriculated Programs". Letterpress Commons. Retrieved 17 April 2015. ^ a b Citrawireja, Melati (July 22, 2015). "A visit with David Goines: Berkeley's legendary letterpress printer and lithographer". Berkleyside. Retrieved 25 July 2015. ^ Waters, Alice. 30 Recipes Suitable for Framing. ^ Hoinski, Michael (February 4, 2015). "Artists Find an Audience for Painstaking Letterpress Printing". The New York Times. Retrieved October 1, 2016. Cleeton, Glen U. & Pitkin, Charles W. with revisions by Cornwell, Raymond L. . (1963) "General Printing – An illustrated guide to letterpress printing, with hundreds of step-by-step photos".